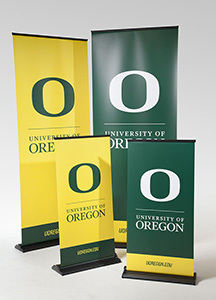 Beautifully-designed, eye-catching UO displays are available for your next tradeshow, convention, or campus event. Items are ‘on loan’ for your event at no cost. You are responsible for pick-up and return of the items. Please return items as they were when picked up; if necessary, clean items prior to return and notify Brand Management and Trademark Licensing of any issues or concerns. Your department is responsible for lost or damaged items. To reserve an item for your event, please submit a request form to Brand Management and Trademark Licensing. A confirmation email will be returned including the pick-up location of the items. Contact Marketing Communications to design your banner or if your department has a banner design to propose. Also contact Marketing Communications for design of a department tablecloth or table runner. If you are interested in procuring banners, tablecloths, or table runners for your department, please contact Campus Copy. The large banners are 7'9" tall by 3' wide and the small banners are 4' tall by 2' wide. Can be quickly set up and taken down at almost any location. There are two colors to choose from: white on green and green on yellow. Please be careful when retracting banner – Carefully hold onto the banner so that it does not tear. The banners are easy to use and transport in carrying cases. Cases can be shipped and taken on flights. The 7' metal Oregon Duck is a beauty, of course. Folks love having their picture with The Duck. Easy to clean with wet cloth if needed, please keep our Duck in good shape. The Duck is in two sections for easy set-up. This piece will require at least two people to move. 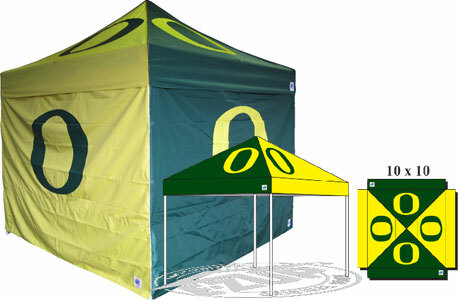 A green tablecloth with the UO’s “Signature Mark” is available in 8’ or 10’. Please clean tablecloth prior to return (no dry cleaning). The 10' x 10' E-Z-up canopy is easy to transport. You may want to use the canopy only, or you can add a zip attachment back and sides for a more enclosed area. Canopy has a protective cover for transportation and is 63” tall by roughly 10" x 10". Easy set-up, requires one person at each corner. Please wipe down or clean before taking down. 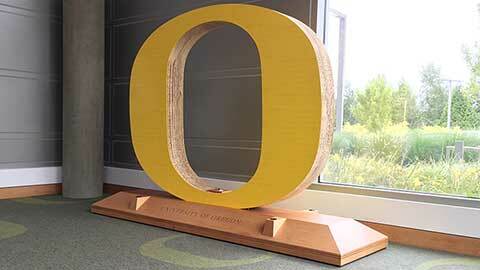 Approximately 6-foot-tall yellow “O” on a large wooden base that says “The University of Oregon.” Stored in a large wooden box which requires a large truck for transportation. The market umbrellas provide shade and work nicely at outdoor events. Easy push-up umbrella with heavy base (which often require added weight to stabilize, especially in windy conditions).